Using biblical and historical data, this book first describes the biblical and theological basis for worship in the Free Church tradition, then shows how this tradition is expressed in worship at special occasions as well as in traditional services. 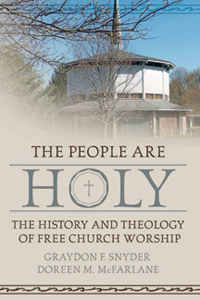 The People Are Holy describes the characteristics of early church worship, then traces how those qualities and practices are realized in the Free Churches. In addition to analyzing all parts of the Sunday worship services, the book includes a consideration of key special services such as baptisms, communions, weddings, installations, healing services, and funerals. In order to demonstrate how preaching functions, the book contains four sermons on key concerns for the Free Church. This book will help members of Free Churches understand why they do what they do when they come together as a faith community. It will help pastors reflect on the theological and biblical basis of how they conduct worship. This is not a “how-to” book. Based on the faith stance of Free Churches in general, it describes what would be the reasonable application of those principles in worshipping communities. Christians not of a Free Church persuasion can discover in this book what inspires so many Americans and marks the way they worship.